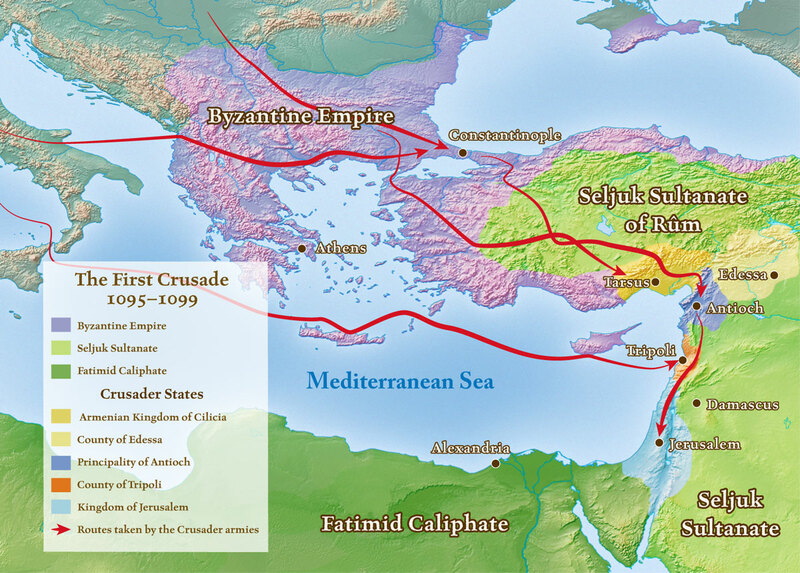 In this episode, we turn our attention to the Near East to explore the spread of the Islam and rise of Muslim science in the Middle Ages. This scientific and literary revolution in the Near East contributed to the English language in some surprising ways. We also explore the connections between healers and holy warriors, and we see how the modern hospital was a product of those two contradictory forces. I’ve been listening for over a year now and this is buy far the best episode you’ve put out yet. I absolutely loved it. I’ve never had more ‘ah-ha’ and ‘wow, so cool!’ moments in a single episode. Keep up the great work! I’m sure you already know this, but on the subject of astronomical terms derived from Arabic there is also azimuth. Thanks as always. Great podcast. Thanks. There were a few words I didn’t include because I thought they were a bit too technical. “Azimuth” is a another good example of a scientific term inherited from Arabic. I find this podcast a lot of fun to listen to, and also informative. However, in Podcast 90, I found the reference to the word “potassium” somewhat confusing, as it seemed to imply the element potassium was known in the Middle Ages as, of course, it was not discovered until 1807 by Sir Humphrey Davy(see https://www.webelements.com/potassium/). Since potassium and the other alkali metals cannot be extracted by traditional smelting methods — they bind very tightly to oxygen, more tightly than does carbon, they have to be separated by electrolysis, that is running an electric current through a molten salt. That needed batteries. 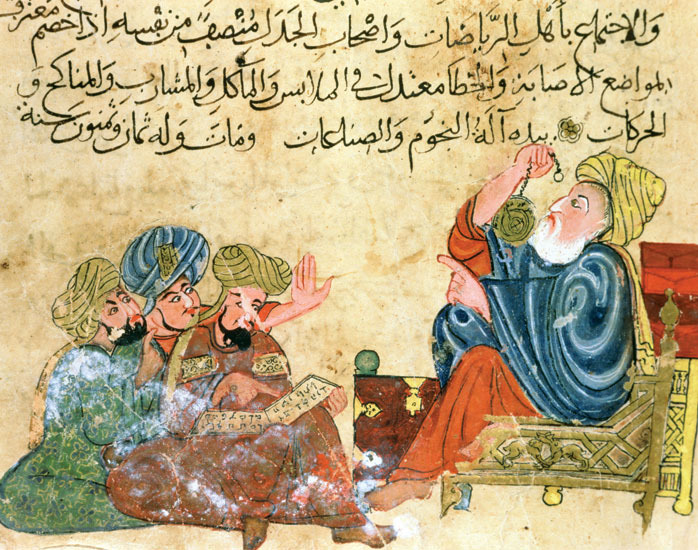 I’ll answer your “Well actually…” with this well actually: Al-Muwaffaq, in the 10th century, wrote The foundations of the true properties of Remedies, describing chemicals such as arsenious oxide and silicic acid. He made clear distinction between sodium carbonate and potassium carbonate, and drew attention to the poisonous nature of copper compounds, especially copper vitriol, and also lead compounds. Levey, M. (1973). Early Arabic Pharmacology. E. J. Brill. Sorry for any confusion. I didn’t actually mention when the word “potassium” was introduced. I just wanted to make the connection between Arabic “al-qaliy” and the chemical symbol for potassium. Hey Kevin. This episode rather surprised me in its theme (dealing with the Middle East and Arabic), considering the rather modest direct Arabic linguistic influences on English. 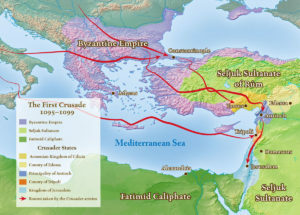 But indeed, I learnt both that Arabic had a slightly larger influence on English vocabulary than I first though, and you did an excellent job of examining how Arab/Muslim scholarship influenced medieval Europe and England around this time, and by way of it the language. All in all, a brilliant episode! Do you know anything about the word “hazard’ by the way? I thought you might have mentioned it, since it seems to be one of the more common words of Arabic origin, that must have come in via French around this time (or perhaps slightly later). Finally, the theme of this episode recalled an excellent film to mind. This is the 2013 German production (albeit in English and starring Ben Kingsley), called “The Physician”. It chronicles the journey of an 11th century young Englishman to Persia to learn of the great medical knowledge in the Islamic world, and bring it back to England. Maybe not perfectly historically accurate, but not too implausible either, from what I could tell. Definitely worth a watch! I’m glad you enjoyed the episode. I should note that this episode is really the first part of a two-part series that will focus on Arabic words, so there will be even more of those words in the next episode. And “hazard” is one of the words which I intend to discuss (even though there is some debate as to whether it actually came from Arabic). Will you be covering why certain (Roman) letter combinations were eventually chosen for non-native sounds, such as the غ (often transliterated as “gh”, such as “Baghdad”)? The “gh”, for instance, doesn’t seem to have any relation phonetically or otherwise with the sound of the letter (which is closer to the guttural “r” heard in French). I doubt that I will cover that specific issue. I don’t speak Arabic, and I don’t really have any resources that discuss the English spelling of Arabic words. If I come across any answers, I’ll follow-up with a comment on this page. First off, I just want to say I’ve discovered your podcast within the last year and it has quickly become my favorite podcast. Underappreciated topic, incredibly informative, and very well put together production wise. I’m a graduate student studying philosophy, and I was wondering if you have any plans to discuss the way English speakers began to think about their language in philosophical terms going forward? I guess I am thinking specifically here of someone like Thomas Hobbes (1588-1679) who wrote extensively on the nature of language (in the English language no less!). At any rate, great episode and I look forward to the next one. Cheers. That’s a great suggestion. I will probably touch on that topic in future episodes, but I am not sure how much time I will spend on it. I have a general plan for the remainder of the Middle English period, but I haven’t really decided on the scope of the Modern English period yet. So stay tuned! My Korean friend used his abacus in “long multiplication”. Instead of writing down the product when multiplying by a single digit he recorded it on the abacus which gave him the progressive result. Do you have transcripts of your podcasts? I would love to see the actual spellings of the original words. 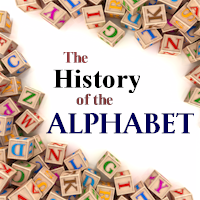 I have transcripts for some of the old episodes available here: http://historyofenglishpodcast.com/transcripts/. 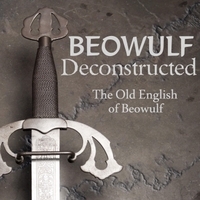 I also have some of the Old English excerpts available here: http://historyofenglishpodcast.com/texts/. 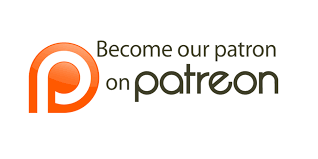 I also offer transcripts of all new episodes at Patreon.com. It seems relevant to bring up that the hospital is one of the greatest institutional achievements of medieval Islamic societies. A notable example is the Adudi hospital built in 982.